A fascinating look at humanity - as it is happening in parts of the world we don't often see. This item is a print by Timothy Bouldry, who has been photographing, exploring and educating people about landfill activity and the people who live from these landfills around the world for 7 years. His widely published photographs have been used by activists to present to the House of Representatives, The US Senate and The Organization of American States. His photographs have been on an international tours, as well as solo exhibitions. He has been interviewed by CNN, various shows in Latin America, and has presented at various universities. Timothy has also been asked by the US Environmental Protection Agency to showcase his landfill photographs and videos for the Vancouver Convention Center during the Methane Expo. 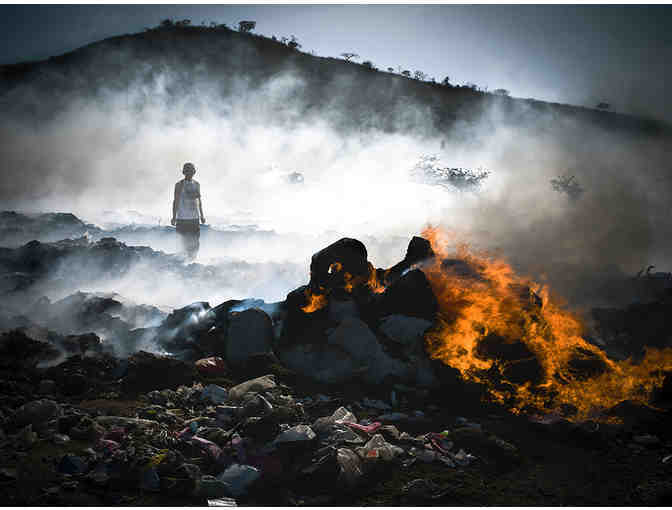 He currently resides in Nicaragua where he is photographing as many landfills in the country as possible. There he has connected with various non-profits and has created gardening projects, teaches English and Yoga, helps with community development and volunteers with the healthcare system. Timothy is proud to be working full time to provide for those affected by landfill life. To view Timothy's amazing work, bio, published work, and past events, look here to see his site. Item ships free within the continental United States.